Drive Monitor has done its job with one of my two drives, spotting a problem and allowing me to change the drive before the old one broke completely. 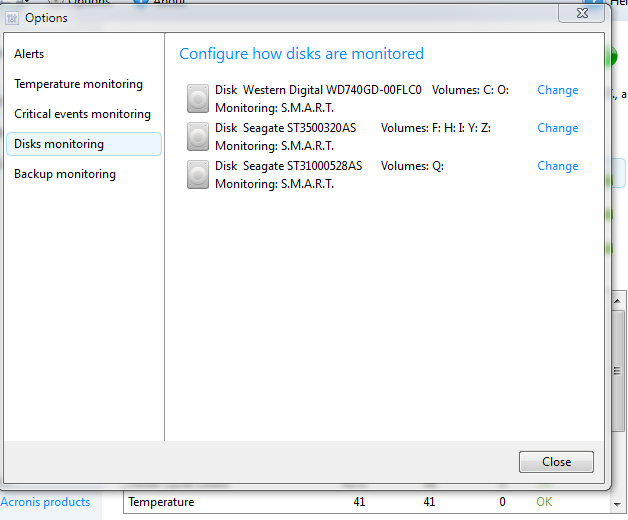 However, Drive Monitor is not seeing the new drive and I wonder if there is a setting somewhere which I am missing. The old drive, seen perfectly, was a Western Digital 250GB IDE drive. The new one is also a Western Digital but 500GB and SATA. Can anyone suggest why the new drive is not being seen, please? I have tried removing and re-installing Drive Monitor without any improvement. I take it Windows can see it OK as can the BIOS? I thought that ADM used the Windows disk access functions to interrogate drives, so at this moment I don't have any idea as to what could be wrong. In theory if it shows in Disk Management it should show up in ADM even if it wasn't a SMART drive. You have checked in the Options\Disk Monitoring section that the disk is enabled (assuming it appears in the list of course). Thanks for the reply, Colin. Yes, the BIOS and Windows can see the drive perfectly. I have absolutely no issue with it other than Drive Monitor not seeing it. A second drive I have, a Samsung IDE, can be seen perfectly. Today I saw that there was a new version of Drive Monitor (released yesterday) so I installed it. Unfortunately there is no change and Drive monitor still cannot see my new disk. The really strange thing is that I have a couple of other programs that can read SMART data and they have no problem seeing my new disk. I am pretty sure, therefore, that it is not my computer or its settings but an issue with Drive Monitor. I am really surprised that it cannot see a common drive like the Western Digital. If anyone has any more ideas I would be really grateful as Drive Monitor performs a really useful function.